The prosecutor's office of Kyiv has launched an investigation after mass media reported the use of force by Berkut riot police outside Kyiv Sviatoshynsky district police department and into an injury to ex-interior minister of Ukraine Yuriy Lutsenko. The prosecutor's office started criminal proceeding according to the article on abuse of power, the press service of Kyiv prosecutor's office reported. The service stressed that they got no reports on beating of people by police, the inquiry was opened under the part 2 of Article 365 – information from the media. Besides, law enforcement agencies launched criminal cases on hooliganism by protesters, illegal interference in the work of a court, as well as resisting police officers. 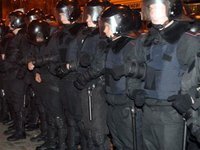 As the press service of Svoboda Union reported, Berkut fighters used force against protesters outside Kyiv Sviatoshynsky court, which sentenced three men to six years in prison each for planning to blow up the monument to Lenin in Boryspil during the Independence Day celebrations in 2011. As a result, activists of Avtomaidan blocked buses carrying Berkut riot police outside Kyiv Sviatoshynsky district police department. Lutsenko was injured in subsequent clashes.